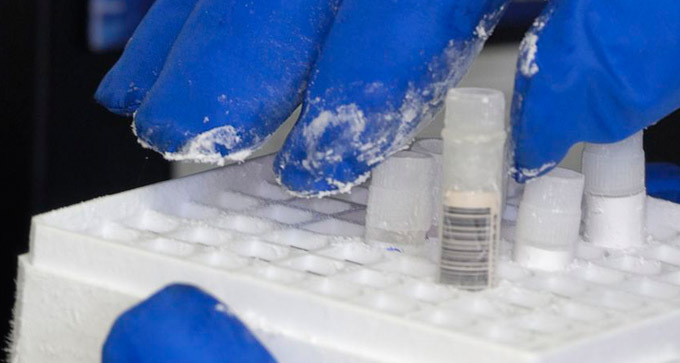 Once stem cells samples reach Biocell lab, they are processed and stored for 19 years at temperature of -196°C inside the liquid nitrogen containers. At this temperature, cells are preserved and the natural biological process is suspended, allowing complete functional recovery when required in the future. The cryopreservation offered by Biocell Center preserves cells in secure structures, equipped with the most advanced technologies. The cryobank used and owned by Biocell Center is made up of liquid nitrogen tanks with a capacity of 10,000 samples each. An electrical back-up system ensures more than 15 days electrical current in case of power failures. Each sample conserved in the cryobank is identified by an proper number (an EAN-13 code) [13 figure European bar code] and the system traces every movement, from arrival in the structure to freezing.